One of our most requested features since launching last month was survey embedding. 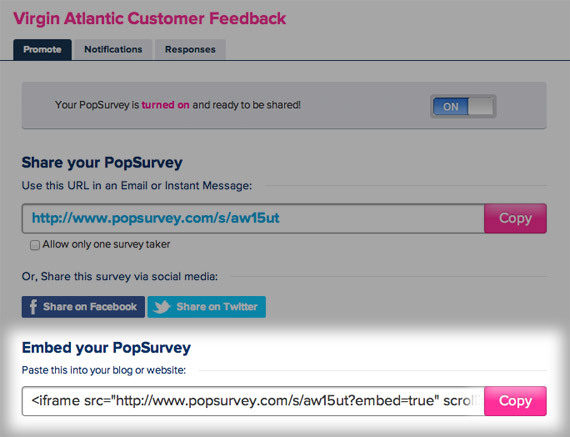 That is, the ability to post your PopSurvey directly on your own website instead of sending a user to a separate survey link. Today, I'm happy to announce that we've launched this feature. You can now embed surveys in your own website, blog, tumblr, etc. You can get your embed code from the "Promote" page that is accessible via the Dashboard next to each survey title. The embed code is at the bottom of the page and all you need to do is copy and paste it and you'll have your survey embedded! Easy as that! There are countless ways you can use survey embedding, so we're extremely excited about this feature. Survey embedding is currently available to users on Premium and Max plans.